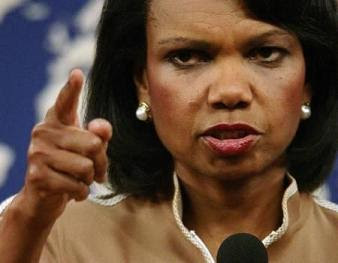 BAGHDAD, April 20 (Reuters) - U.S. Secretary of State Condoleezza Rice said on Sunday she did not know how seriously to take a threat of all-out war by Iraqi cleric Moqtada al-Sadr, and rebuked him for threatening violence while living abroad. Sadr, whose Mehdi Army militia have battled U.S. and Iraqi government forces, threatened on Saturday to launch an "open war until liberation" against the U.S.-backed government if it continued a month-old crackdown on his followers. The threat from the Shi'ite cleric was followed by what the U.S. military called the heaviest fighting for weeks in his east Baghdad stronghold of Sadr City. "He is still living in Iran. I guess it's all out war for anybody but him," Rice said of Sadr, who has not appeared in public in Iraq in nearly a year. "His followers can go to their death and he will still be in Iran," she told reporters travelling with her on a trip to Baghdad. The U.S. military has said Sadr has spent most of the past year in neighbouring Shi'ite Iran. Said Condi from the safety of a bunker in the Green Zone. Wow, taunting the defacto leader of Iraq. How high school. This is why our foreign policy is in the state it is in. This clown Rice wants to sound like her "Bring 'em On" boss. Maybe next she can "Double Dog Dare" him to come out of hiding. Oh and Condi he isn't in Iran. Nice try, you don't know where he or Bin Laden are. Just go buy some more shoes, leave the counter insurgency to the experts.